When Kenwood introduced its NEXEDGE® range of advanced digital two-way radios in 2008 it was the first system to offer both Mixed Mode (the ability to communicate with both analogue and digital handsets automatically, without manual switching) and trunked radio communication capability. Built on the solid foundations of over 30 years of success and now with over 600,000 devices in use around the world, Kenwood NEXEDGE® equipment has proven that it is able to deliver clear voice quality and reliability, even in the noisiest of environments while its digital encryption provides complete protection against casual eavesdropping. All NEXEDGE® equipment can communicate with existing analogue radios, either terminal to terminal, as a system, or even as a multi-site trunked network. This provides a cost effective and controlled solution to customers migrating from an analogue system to the proven advantages of digital. Winner of the Innovation in Business Radio Award at the 2010 Federation of Communications Services AGM, NEXEDGE® has been designed to deliver the safety, security, efficiency, performance and future-proofing that the market demands from leading edge digital two-way radio communications. All NEXEDGE® equipment operates in 25 & 12.5 kHz analog and 12.5 & 6.25 kHz NXDN™ digital modes – satisfying spectrum requirements today & tomorrow. NEXEDGE® extends the life of current radio system assets. All NXDN™ digital modes use the same Class-C power amplifiers and site management equipment used for current analog stations, ensuring return on investment (ROI) and a multitude of supplier choices. Current analog and NXDN™ digital fleets can share a NEXEDGE®base/repeater station in 12.5 kHz conventional “Mixed Mode,” thus providing uninterrupted service as long as needed and a straightforward migration path as aging analog fleets are replaced with digital. Also, NEXEDGE® trunked traffic channels can be shared with existing external analog conventional or trunked logic controllers, extending service to fleets as a transition to NXDN™ trunking is underway. The AMBE+2™ Vocoder is a state-of-the-art voice compression digitization technology that offers superior clarity at varying signal strengths, even at highway speeds. NEXEDGE® technology offers inherent security against casual electronic eavesdropping via its digital air interface. It also includes NXDN™voice & data scrambling for security against external threats while providing confidentiality within the same system and talk group. Inter-network links are further secured through encrypted VPN tunneling. Also NEXEDGE® multi-site network operators can automatically validate individual subscriber radio hardware by ESN (a unique factory-embedded Electronic Serial Number ) rather than changing the system’s unit and group ID lists in the event a unit is lost, stolen, or removed permanently or temporarily from service. The NEXEDGE® System Manager for NXDN® trunked sites and networks reduces operational and maintenance costs with remote programming, firmware uploading, subscriber unit privileging, monitoring and diagnostics capabilities all from a secure user-friendly Windows®-based application via direct connection, dial up modem, or IP connection. In analogue systems as the signal strength decreases in low-coverage areas, noise and dropouts increase, severely degrading intelligibility. However, with the NXDN® digital system, which features enhanced Forward Error Correction (FEC), the digitized audio stream is less susceptible to noise, resulting in superior clarity at varying signal strengths. System operators converting from analogue to NEXEDGE® typically comment that users now receive calls in areas that were out of range before. NXDN® reduces lost or misinterpreted calls and the need for repeat calls, thus enhancing workforce productivity. A key element of the NXDN™ air interface is the AMBE+2™ vocoder which digitises speech while retaining natural voice nuances, performs noise reduction, introduces FEC and compresses this voice data to accommodate land mobile radio data rates. Next, the radio’s digital signal processor (DSP) protocol- packages the vocoder, signaling, control, and more FEC data together and converts this to a uniquely filtered 4-Level FSK digital waveform that modulates the transmitter. This results in an unusually low bit-error-rate digital air interface delivering robust communications even in weak signal strength areas. The NXDN™ air interface is capable of fitting into both narrow 12.5 kHz and very narrow 6.25 kHz bandwidth channels meeting the tightest of spectrum efficiency requirements (9600 bps @ 8.3 kHz and 4800 bps @ 4 kHz occupied bandwidth respectively). NXDN™ is a Frequency Division Multiple Access (FDMA) methodology whereby one user accesses a channel frequency at any one point in time (i.e. accesses via the frequency domain). Other digital methods such as Time Division Multiple Access (TDMA) permit more than one user to access the channel frequency via timeslots (i.e. accesses via the time domain), but there has to be a tradeoff between coverage and effective transmission rate, as increasing the former means decreasing the latter. In addition, NEXEDGE® equipment can support legacy analogue modes. NEXEDGE® base units include a 16-RAN(Radio Access Number) capacity conventional repeater controller for 16 user group site sharing. The 65,519 (each) Group ID and Unit ID capacity adds group and individual selective calling capability beyond conventional analogue. Also Mixed mode operation allows analogue & NXDN™ conventional units to share the same RF channel. * Version 2.0 or later and certain routing type required [16 (unicast); 48 (multicast)] for maximum number of repeaters per network. security and faster communications with less required user operation than conventional systems. The system automatically assigns channels for faster, efficient use of spectrum, allowing users to concentrate on the job at hand. The 3,000 (each) Unit ID and Group ID per-site capacity provides ample unit and fleet organization capabilities. Group and Individual calls enjoy complete privacy as other users in the system cannot monitor the calls. The Priority Monitor feature will monitor for up to 4 high priority talk groups and switch users to those calls in progress so important calls are not missed. During peak usage hours, system Call Queuing stacks call requests and processes calls when a channel becomes available. System operators can assign important individuals higher queue priority and even pre-empt lower priority users for more important dispatch and emergency calls. 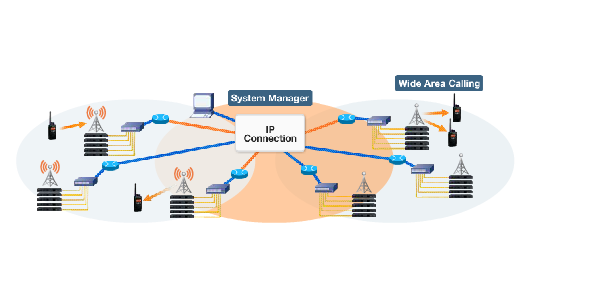 This innovative system consists of a monitor station and a base station, linked via NEXEDGE® digital transceivers. Still images are transmitted from the remote site to the base station computer, which serves as the control center. This allows the simultaneous monitoring of several sites where it would be difficult or uneconomical to install wired communications infrastructure – waterways, dams, national parks, temporary construction sites and so on. To harness and exploit the full potential of Kenwood two-way analogue and NEXEDGE® digital radio equipment, Kenwood has introduced the Kenwood Solution Developers Programme (KSDP). Every specialist company in the Kenwood Solution Developers Programme has been selected for their software and/or hardware solutions designed to work with Kenwood NEXEDGE® or analogue radios. While KSDP members are all independent companies, they are nonetheless part of the extended Kenwood family in recognition of their commitment to delivering the highest standards of quality and service. The Kenwood Solution Developers Programme underlines the company’s commitment to long term investment in the NEXEDGE® digital radio communications system into the future.